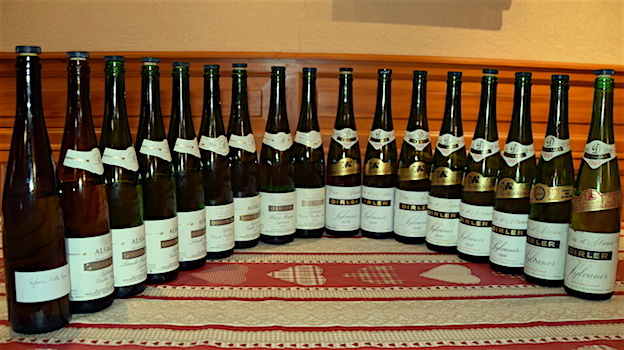 One reason I never miss a chance to visit Jean Dirler and his family is that the Dirler-Cadé estate in Bergholtz makes outstanding wines from several different Alsace varieties. Its Sylvaner, a grape often treated as an afterthought in Alsatian wine-production circles, is especially noteworthy. I do not feel that I am exaggerating when I describe it as a world-class wine The fact that it ages extremely well is an added bonus. The Jean Dirler estate goes back to 1871, when it was founded by the original Jean Dirler. Four generations later (following Georges, Georges and Jean-Pierre), another Jean Dirler married Ludivine Cadé and in 2000 took over the nine hectares of vines that had been worked by Ludivine’s father, Léon Hell-Cadé, renaming his estate Dirler-Cadé. Today Dirler-Cadé owns 18 hectares (29% of the estate is planted to Riesling, with Gewürztraminer the second most important variety here), including a number of parcels in famous grand crus such as Spiegel, Kessler, Kitterlé and Saering. In fact, almost 50% of the estate’s vines are located in grand cru sites. Now engaged in biodynamic farming, Dirler has since replanted most of his father-in-law’s old property with massale selections from the Hebinger nursery in Eguisheim. Production hovers around 90,000 bottles per year. The Dirler family has always held Sylvaner in high esteem. “It’s a very underrated grape,” says Jean Dirler. “People fail to treat it with the respect it deserves in the vineyard, so Sylvaner rarely gets to show its true colors. And that’s an absolute shame, since it’s an outstanding food wine, much better than many Gewürztraminers and Pinot Gris wines that are blowsy and over the top.” I certainly agree. Sylvaner does remarkably well when matched with crustaceans and shellfish of all kinds, as well as with asparagus, artichokes and cilantro, all notoriously tricky for pairing wines. I should note that I am not the only fan of Dirler-Cadé’s Sylvaners. The wine is so popular that it’s sold at a higher price than the estate’s Pinot Blanc, which is rarely the case in Alsace. Sylvaner is a lovely variety to look at as well as to taste, with its greenish berries capable of producing delicious, fresh wines redolent of white stone fruits, quince, minty herbs and green apple. (There is also a red-berried variant but my own feeling is that this is a different grape variety, rather than a mutation of the more common “green” Sylvaner.) When it’s harvested late, Sylvaner can give truly profound, honeyed sweet wines boasting rich aromas and flavors of apple compote, quince jam, ripe citrus fruits and chamomile, while dry versions can offer delicate stone fruit and herbal nuances, with earth and mineral notes of crystalline purity. Sensitive to both powdery and downy mildew, Sylvaner does not handle frost or overly hot weather well. It is also prone to chlorosis (yellowing leaves that have insufficient chlorophyll to ripen the grapes). Budbreak occurs just before Riesling, and Sylvaner is harvested fairly late in the year, rarely beginning before late September—but sometimes as much as a month later, if a late-harvest wine is the aim. A potentially very generous producer, Sylvaner can put out waterfalls of grapes, which explains much of the insipid, neutral plonk that has given the variety its reputation for pedestrian wines. Clearly, at yields of 100 hectoliters per hectare—as was commonplace for Sylvaner back in the 1980s, when the variety accounted for 20% of Alsace’s plantings—no grape variety can show its best. In Alsace, Sylvaner’s woes were further compounded by the ill-conceived wine law of 1975, modified in 1983, which failed to recognize Sylvaner as a “noble” grape. Consequently, like Pinot Blanc, wines made from Sylvaner could not benefit from the words “grand cru” on the label (and clearly, the term helps to sell wines, regardless of the quality that’s actually in the bottle), leading producers to rip much of it up and to replant with Riesling, Pinot Gris and Gewürztraminer, even in sites that are not especially suited to those three varieties. Recently, an exemption has been made for the Zotzenberg site, where Sylvaner can now be labeled grand cru, but this is a small fix at best. Other marvelous sites for Sylvaner, such as the Zinnkoepflé, are still not recognized as grand crus for the variety. Sylvaner’s fall from grace is also attributable to the fact that it is not one of the grapes allowed for production of Crémant d’Alsace (the region’s increasingly popular sparkling wine) owing to its relatively low acidity. Consequently, it makes little economic sense to plant Sylvaner. 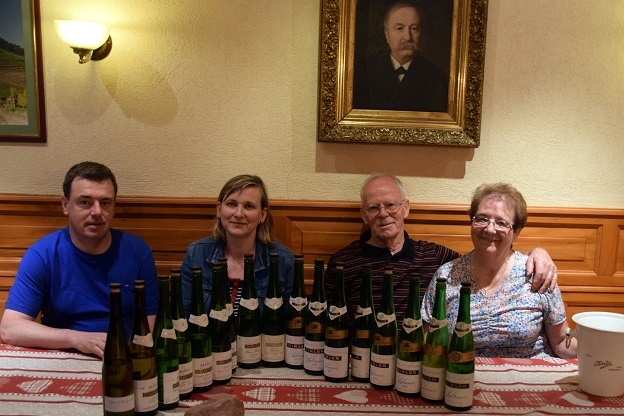 But there are encouraging signs that besides Dirler-Cadé, producers in Alsace are starting to devote more attention to Sylvaner: Agathe Bursin, Albert Seltz, Barmès-Buecher, Josmeyer, Muré, Ostertag and Seppi Landmann, among others, all make outstanding wines, while Albert Boxler, Kuentz-Bas and Léon Beyer also offer noteworthy versions. It is worth pointing out that the majority of Sylvaner vines in Alsace are quite old (40 to 50 years or more), which goes a long way toward explaining the quality of many of the wines made by dedicated producers. Most of these estates are beginning to plant additional small quantities of Sylvaner. Until recently, Dirler, who generally prefers not to harvest his Sylvaner late, offered two different Sylvaner bottlings, a Vieilles Vignes and a single-vineyard wine from the Heisse Wanne lieu-dit. 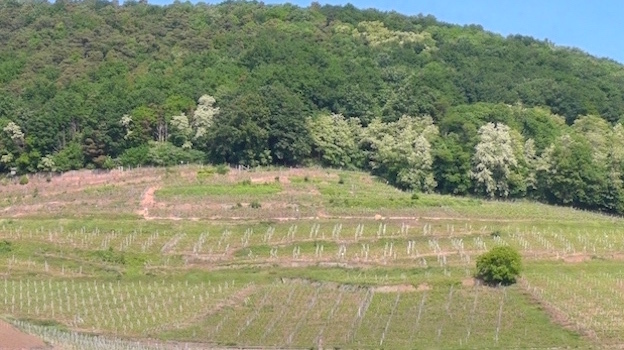 The Wanne is actually anything but a lieu-dit in quality and reputation; in fact, it’s more deserving of grand cru status than many other Alsace sites that have been labeled as such, often for political reasons. Back in the 16th century, the Wanne was considered one of the three best plots in all of Alsace, along with the Rangen and the Brand—heady company indeed! Located in the central part of the Kessler grand cru, the Wanne was historically subdivided into three sections, of which the Heisse Wanne is the best known and the warmest (the Kessler itself is already a warm site), so its wines tend to be rich and flavorful. In my opinion, just about the only drawback associated with the Heisse Wanne is that its soils of red sandy clay over limestone and sandstone bedrock are not as deep as those elsewhere in the cru, and drainage is quite good, which means the grapes can suffer from hydric stress in hot, dry years. Dirler’s Sylvaner vines in the Heisse Wanne were planted in 1959. The resulting wine is deep and luxurious, but the Vieilles Vignes bottling, as its name suggests, is no slouch either when it comes to the age of vines, as the grapes used to make it are culled from roughly 40-year-old vines planted in the Bux and the Schwarzberg lieux-dits. In any case, this is a moot point nowadays as Dirler has opted to produce just a single Sylvaner bottling beginning with the 2013 vintage, in the belief that two Sylvaner selections risk impoverishing the Vieilles Vignes bottling. In a confirmation of Sylvaner’s recent tough-luck status at the cash register, Dirler also candidly admitted that he was having trouble selling two different Sylvaner wines. But given the renewed interest in the grape variety, things are set to change for the better. I tasted the wines in this vertical last September with Dirler and his family at the estate.